Although open plan seems to be the flavor of the decade, it is amazing what can be achieved with dry walling partition installation. Creating arches or bulkheads and much more for office or residential environments. All you need is a bit of creativity and a good contractor to fulfill your request. Our specialised dry walling, ceiling, Crete stone and plaster contractors will deliver your requirements with very little inconvenience. Please remember, although every effort will be made to protect your furniture, plaster dust is very fine and sneaks in all over. Even when erecting the partitioning, the wall and ceiling boards contain a dry cement plaster formula. Therefore, during the installation it is advised to cover as much as possible, and tape up localised cupboards and wardrobes to prevent the fine dust from penetrating. We specialize in the design and installation of drywall solutions/systems for walls and suspended ceilings. We install drywall systems and suspended ceilings that meet your aesthetic and functional requirements. Our drywall experts work with projects large and small to offer the best solutions. 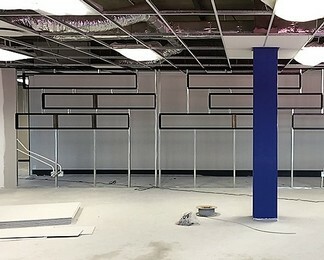 Partitions are a fast, easy and cost effective way of making a division wall in any room. We are able to convert a one bedroom flat into a two bedroom flat or take a large room and divide it into another bedroom or study. Take a large kitchen and make a scullary. Divide a double garage into another lounge, study or bedroom. Drywalling provides you with endless options. We have the technology, skills and know how to virtually create any partition with drywalling for your domestic requirement. Drywalling is creating quick walls without the mess and hassles. We have divided garages, lounges, diningrooms, large bedrooms into another living space by utilising drywalling. Drywalling is at least 50% less expensive than cement walling and is done in half the time with much less waste and trouble. We create finishes that is equal and better than normal plastering and the drywall looks exactly like the original brick walls. We create a steel frame with steel studs spaced every 600mm, thus creating a very strong structure against which we erect 12mm gypsum boards on both sides to create a solid, almost sound proof wall. You will be able to mount shelves etc against this strong drywall partition, by mounting the shelves onto the steel stud frame. We offer the most up to date drywall textures, finishes, colors, and designs. We have talented crew of craftsman (combined 30 years experience) who can create the texture and finish you desire. 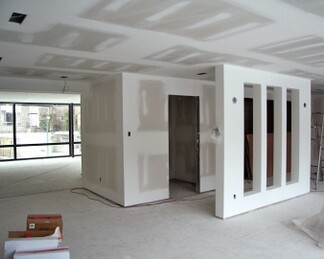 We offer drywall construction projects for commercial, industrial, office, warehousing and business applications. 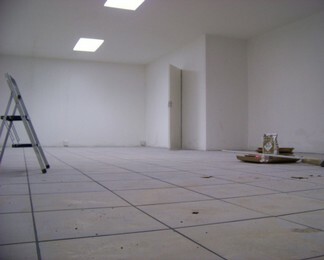 We provide professional partitioning and drywall installation services to commercial clients. We provide high quality drywall installations to your individual requirements, including onsite manufacturing and installation of drywall to your specification. All our installations are carried out in strict accordance with building regulations. We can supply and fit drywalling for developers, shop fitters and commercial construction companies. No job is to big and we manufacture to specifications. The emphasis from our friendly team is on professional customer service and attention to detail. South Africas number 1 drywall installation contractor. 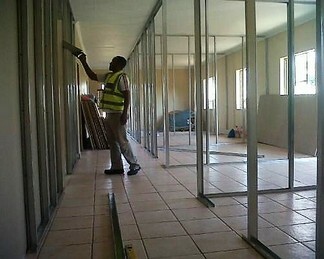 Drywall installation contractors in Gauteng. Drywall installation contractors in Durban. Drywall installation contractors in Cape Town. Skilled drywall installation contractors have years of experience in drywall installation. Well established company that endeavours to fulfill all the requirements of a drywall installation contractor. Prides itself on the successful drywall installation solutions in Gauteng, Durban and Cape Town. High standard of quality at the most economical drywall installation prices in Gauteng, Durban and Cape Town. Drywall installation solutions in Gauteng, Durban and Cape Town. 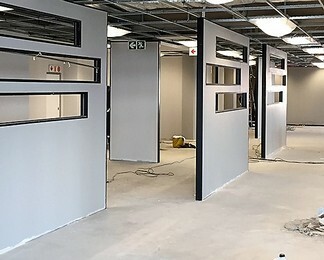 Premier residential and small-scale commercial drywall installation solutions in Gauteng, Durban and Cape Town.